SUVA (Reuters) - Voters in Fiji's election this month are keen to end a dictatorship that has ruled the South Pacific island nation since a military coup in 2006, but sprucing up its human rights situation, and ties with Western neighbors, will take time. Change could be slow because Voreqe "Frank" Bainimarama, the army chief who seized power to become prime minister, looks set to retain a dominant role, with polls giving his Fiji First Party a strong lead in the run-up to the Sept. 17 election. The much-delayed vote is being closely watched by neighbors Australia and New Zealand, the region's economic and diplomatic powerhouses. They and their Western allies are eager to welcome Fiji back to the fold after eight years of diplomatic, military and travel sanctions that appear to have achieved little. Far from being frozen out, Fiji has lifted its global profile, setting up an alternative forum for Pacific island issues, heading the G77 group of developing states in 2013 and contributing peacekeepers to the United Nations. Dozens of its soldiers are being held by Islamists on the Golan Heights. Fiji has also forged stronger ties with new partners, in particular China, which is establishing an ever greater presence across the Pacific. "Fiji has certainly made it clear they can work without us internationally," said Jenny Hayward-Jones, a regional expert at Sydney think tank the Lowy Institute. "We need to get Fiji back in the tent because it is not being a very cooperative regional partner and that's what really matters." Fiji's 300-plus islands sit near the center of a vast swathe of the South Pacific that is home to only about 10 million people, but is crisscrossed by vital shipping lanes and controls huge maritime and mineral resources. Its importance is recognized by the United States, which aims to shore up what many see as the West's sliding prestige in the region, as part of President Barack Obama's "pivot" to Asia. 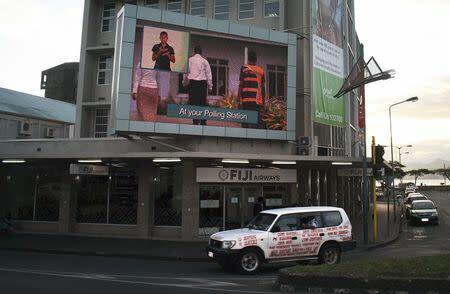 "Our commitment to the people of Fiji has never wavered, and subsequent to credible elections, we look forward to working with those elected to create closer ties between our two nations," a U.S. embassy spokesman told Reuters. A hospital ship moored in the harbor of Suva, the capital, ringed by coral reefs and jutting mountains, is a symbol of China's more prominent role. The vessel, the Peace Ark, offers free health care as it sails through the South Pacific, where hospitals often struggle to supply even basic services. China is building ports, roads and other projects around the region, and runs a bauxite mine in Fiji. Bainimarama calls China a true friend, while playing down the importance of Australia and New Zealand. But few Fijians share that view. Many people are wary of Chinese projects funded by loans, employing mostly Chinese workers and using Chinese equipment, said Sainiana Radrodro of the SODELPA opposition party. "Whilst we appreciate that we have a strong diplomatic relationship with China, we just do not think it should come at the expense of a lot of debt that our people will be paying off for many, many years down the line," she told Reuters. Some Fijians also think the West is being too hasty to rekindle relations with a regime still tarred by the coup. At the root of much of political conflict in Fiji is rivalry between indigenous Fijian nationalists and the ethnic Indian descendants of workers brought by the British to work sugarcane fields. Animosity came to a head in 2000 when indigenous Fijians overthrew the first Indo-Fijian prime minister. A new constitution introduced by Bainimarama, while criticized by some for its curbs on freedoms, has been welcomed by many ethnic Indians for giving them equal rights with indigenous Fijians. 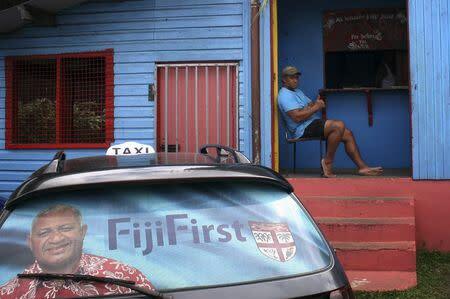 "What has happened in Fiji are big changes, big improvements," said Rupeni Turagakula, a burly 43-year-old taxi driver, adding that relations between indigenous Fijians and ethnic Indians had improved, along with the economy. In March, Fiji returned to the fold of the Commonwealth grouping of mostly former British colonies, after a suspension of almost five years over a delay in restoring democracy. In a report last month on Bainimarama's government, Amnesty International listed what it called serious human rights abuses over the past eight years, including attacks on journalists and unionists and curbs on speech. Accusations of brutality are common in Fiji, where security forces function in a culture of impunity, says human rights advocate Virisila Buadromo. "It just reinforces in the public's mind that no one is safe," said Buadromo, a leader of a women’s rights movement. "That we have to be very careful about what we say, because we could end up getting taken in by the military or the police." 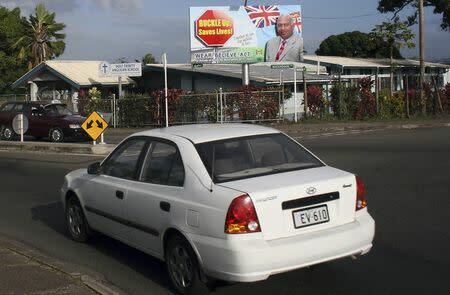 Fiji's economy is forecast to grow at 3.8 percent in 2014, exceeding its historical average, while new roads and water supply to villages have helped lift Bainimarama's support in the polls to around 60 percent. Fears of more instability, or even another coup, may worry some, but not everyone is fretting over the election result. Stefan Pichler, managing director of national carrier Fiji Airways and chairman of Tourism Fiji, said previous coups had only a fleeting impact on the tourism industry, the country's biggest employer and earner of foreign exchange. "Governments come and go, that's the reality," he told Reuters. "You're talking about politicians, who make noise, versus people who look for holidays. That's two different planets."